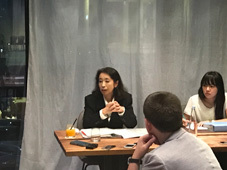 At the meeting with Georgian media, Ms. Mitsuko Shino – Deputy Press Secretary of Foreign Minister of Japan summarized Mr. Taro Kono’s visit to Georgia. “Even though we have 26 years of diplomatic relations between our countries, it is the first time that Japanese Foreign Minister visited Georgia. It took a long time, but this is a good moment to speed up our relationship”, said Ms. Shino. Mr. Taro Kono was impressed with Georgian history and rich cultural traditions by visiting Georgia’s historic places, such as Jvari Monastery and Svetitskhoveli Cathedral, said Ms. Shino. She then listed the important meetings that the Foreign Minister of Japan Mr. Taro Kono held with the Georgian officials, such as Foreign Minister of Georgia David Zalkaliani, the President Giorgi Margvelashvili, Prime Minister Mamuka Bakhtadze and the members of the Georgian parliament from the ruling party as well as the opposition. Ms. Mitsuko Shino underlined the fact of signing the Loan Agreement on the East-West Express Highway Project (Phase Two), the document according to which the Government of Japan will allocate preferential loan of USD 343 million to Georgia, through Japanese International Cooperation Agency (JICA). Having had these intensive meetings and discussions with the Georgian side, the Foreign Minister of Japan was more than happy to find out that Georgia is the country who shares the common values of human rights, democracy, the rule of law and freedom. Self-sustained development of Caucasus Region is divided into two pillars. Therefore, the first pillar involves the assistance for the development of architects for state building, described in easy language, the assistance for the human resources development. “We would like to assist your country or the Caucasus region in developing the human resources and human resources in the areas of the rule of law, environmental disaster reduction, economic, social and industrial infrastructure and so on”, said Ms. Shino. Language education assistance in cooperation with Japan Foundation, continuous provision of contents for broadcasting. The Deputy Press Secretary of the Foreign Minister of Japan confirmed that “the Caucasus region is quite an important juncture geographically, and it is for Japan kind of a gateway or the bridge between Asia and Europe and furthermore to the Middle East. So for our country, the stability of Caucasus is not only the interest of this region but overall stability of the international society, so we would like to support this stability in Caucasus region, and that’s the reason why we have launched this initiative. The concrete measures for appealing the Caucasus is that we are introducing multiple visas, which is starting on the 1st of October, we will give the multiple visas for the short term visitors in Japan that will encourage people from Georgia to visit Japan and from Japan to visit Georgia”. “Investment treaty will be a certain agreement, which will facilitate the promotion of the investment of Japanese companies in Georgia. The implementation of the project East-West Highway will make the logistic easier and will make Georgia and Caucasus region more attractive for the Japanese companies because it will expand the market for the companies which are going to invest in the region”, was Ms. Shino’s explanation. The same sort of initiatives are going to be launched in all three countries of Caucasus region (Georgia, Armenia, and Azerbaijan) sort of by multiplying the effect over the region. Concerning the international issues, the variety of themes have been discussed during the visit of the Japanese delegation, they have addressed Tskhinvali and Abkhazia region, and the two sides exchanged the views on finding the peaceful solutions, based on UN Resolution and Human Rights Council. Japanese side underlines the importance of international solidarity and the international community to keep the commitment or to keep the sanctions and resolutions of UN Security Councils and Georgian Government is fully supportive of the Japanese policy. 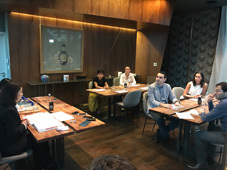 Ms. Mitsuko Shino has mentioned the number of activities/events that are planned to be held in Japan, where Georgia is welcome to participate or is already taking part in some of them, such as Food Expo, IT Week, Tourist Expo, World Rugby Cup in 2019 and so on. Last info the Deputy Press Secretary shared was concerned with a large traditional ceremony to welcome the new Emperor in Japan, where they invite the heads of all the states in the world, which is a great chance to visit Japan and report directly from Japan and get closer to Japanese culture and society. “We are both rich in history, and it is important to preserve our traditions while accommodating or adjusting to the modern world. These requirements are common for both of our countries”, added Ms. Mitsuko Shino.